Best season to visit : The climate in Bandipur remains temperate throughout the year, but the best time to visit the park is between October and May. Situated at the confluence of the Western and Eastern Ghats, the Bandipur National Park serves as a natural pathway that is used by herds of elephants for their annual migration -a phenomenon that to an extent is similar to the wildebeest migration in Serengeti, though on a somewhat smaller scale - from the Mudumalai Sanctuary and Satyamangalam forest division in the east and south east to the Nagarahole National Park and the Wayanad Sanctuary in the west and north west. The park has a high concentration of elephants as well as adult tuskers making it amongst the best destinations to observe this massive but graceful animal. The Bandipur National Park is an ecologically important area because it is part of the 5500 sq.km 'Nilgiri Biosphere Reserve', which is counted amongst the country's biggest conservation areas. It is not just the elephants and their migration that is famous about the park, but there are other animals, including large predatory carnivores like the leopard, tiger and dholes; as well as seven large angulate species (muntjac, chital, sambar, chousingha, gaur, wildpig and elephant) that give the park its diversity and unique status as one of the best parks in the country. Since the park is a Tiger Reserve, being brought under the ambit of Project Tiger in 1973, there is a distinct edge as far as conservation of this precious animal is concerned. Also, a byproduct of bearing this status is that more work has been done to control, if not completely wipe out, poaching activities and this has resulted in other wildlife also reaping in the benefits -the population of many animals whose numbers were significantly low prior to 1973, has rebounded significantly. Even another advantage is improvement in the habit that is now more capable of sustaining the increasingly diverse wildlife of the park. The park was once the private hunting ground of the Maharaja of Mysore who was instrumental in laying down the foundation of a sanctuary, spreading over an area of 90 sq km, in 1931. The park was then known as Venugopala Wildlife Park. When it became a Tiger Reserve in 1973, almost 800 sq km of additional area was added to the existing 90 sq km area of the sanctuary. The altitude of the park can vary between 680 meters (2,230 ft) to 1,454 meters (4,770 ft). An outcome of these variations is that as you move from one altitude to another, the vegetation changes. Some of the important biomes observed across different altitudes are dry deciduous forests, moist deciduous forests and shrublands. The difference in vegetation and altitude of the park has ensured that the animal species are also equally diverse. There are two major rivers that pass along the edges of the park-the Kabini River to the north and the Moyar River to the south, while the Nugu River passes right through the heart of the river. The highest point of the park lies on a hill, Himavad Gopalaswamy Betta, and there is also a Hindu temple perched atop this hill. The salubrious climate of Bandipur National Park has been instrumental in nurturing a large diversity of plant species. The flora of the park is mostly dominated by dry deciduous, evergreen forests, scrubs and large expanses of open grassy woodlands. Scrubs, chiefly underdeveloped trees and bushes, can be predominantly found in the eastern parts of the park, but as one moves to the northwestern parts of the park, the vegetation changes dramatically from dry deciduous to tropical mixed deciduous forests. The park is famous for its timbers, especially Teak (Tectona grandis), Indian-laurel (Terminalia tomentosa), Indian Kino Tree (Pterocarpus marsupium), giant clumping bamboo (Dendrocalamus strictus), clumping bamboo (Bambusa arundinacea) and Grewia tiliaefolia being notable ones. There are also a number of flowering and fruiting tress as well as shrubs that make up the landscape of the park. Some of the important ones include Kadam tree (Adina cordifolia), Indian gooseberry (Emblica officinalis), Crape-myrtle (Lagerstroemia lanceolata), axlewood(Anogeissus latifolia), Black Myrobalan(Terminalia chebula), Schleichera trijuga, Odina wodiar, and Flame of the Forest(Butea monosperma). The name Dhole’s Den is derived from the Dhole, the Asiatic wild dog (Cuon alpinus). For many years it was hunted down as vermin but it is one of the most fascinating hunters in the Indian jungle with a complex and unique social hierarchy. Tuskar Trails resort affectionately adore your visit to experience its panache and enjoy the marvels of its magnetic ambience, which truly ponders in its exotic interiors and designs of its premises. Cicada resorts give you a warm invitation to come and enjoy the peaceful ambience of the place, while availing luxurious accommodation facilities available for the tourists. Brilliantly located in the state of Karnataka, India. Bandipur happens to be one of the most diverse ecosystems in the country with a number of endangered and vulnerable species like Indian elephants, gaurs, tigers, sloth bears, muggers, Indian rock pythons, four-horned antelopes and dholes being found in the park. The elephant is the biggest mammal of the park and attracts a lot of attention among visitors, but there are also a number of smaller mammals that you can easily spot in the park like the chital, gray langur, and Indian giant squirrels. The leopard and the tiger, which belong to the cat family and are apex predators, also grace the park leaving behind a trail of blood wherever they go. They are amongst the best hunters in the wild being equipped with powerful jaws, flexible body and a killer instinct that is unparalleled. Among the prey animals, the four-horned antelope which is a vulnerable species is the most popular and is only found in India and Nepal. Other prey animals include mouse deer, Indian wild boar, spotted deer, and bonnet macaque. As many as 200 bird species are residents of Bandipur National Park. Commonly seen birds of the park include peafowl, grey junglefowl, crows and drongos. Birds like honey buzzards, red-headed vultures, Indian vultures, flowerpeckers, hoopoes, Indian rollers, brown fish owls, and crested serpent eagles are also seen in the park. Many species of the reptile family can be found in the park including the likes of spectacled cobra, Indian rock python, vipers, rat snake, muggers, monitor lizards, and Indian chameleon, to name a few. As for butterflies, there are over a hundred species that are residents of the park with common rose, crimson rose, common jay, tailed, lime butterfly, malabar raven, common mormon, red helen, blue mormon, southern birdwing, and common wanderer being a few among them. How to reach : An important reason why Bandipur is widely regarded as one of the best parks in the country has to do with how well it is connected to all the major cities in the country, be it by air, rail or road. Consequently, getting in and out of the park is convenient and uncomplicated. By Air : Bengaluru International Airport, at a distance of 215 from the park, is the nearest airport and is well connected to all the major cities like Mumbai, Guwahati, Kolkota, and Delhi. Being an international airport, it covers international destinations like Kuala Lumpur, Muscat, Doha, Singapore, Bangkok, and Dubai as well. By Rail : The nearest railway station is at Mysore, 80 km from the park. From the railway station, travelers need to hire a taxi to reach the park. By Road : Bandipur National Park is easily reachable from all the important cities of Karnataka by road. 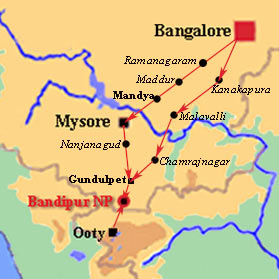 Also, there are a number of state buses that regular commutes between Bandipur and Mysore, and between Bandipur and Bengaluru.